Yesterday, I was passing by your rectangular house in trigonometric lane. There I saw you with your cute circular face, conical nose and spherical eyes, standing in your Elliptical garden. 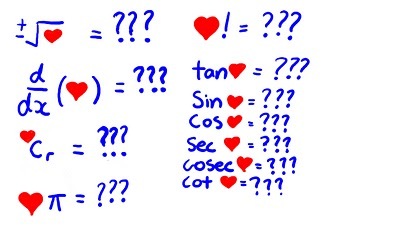 Before seeing you my heart was a null set, but when a vector of magnitude (likeness) from your eyes at a deviation of theta radians made a tangent to my heart, it got differentiated. My love for you is a quadratic equation with real roots, which only you can solve by making good binary relation with me. The cosine of my love for you extends to infinity. I promise that I should not resolve you into partial functions but if I do so, you can integrate me by applying the limits from zero to infinity.You are as essential to me as an element of a set. The geometry of my life revolves around your acute personality. My love, if you do not meet me at parabola restaurant on date 10 at sunset, when the sun is making an angle of 160 degrees, my heart would be like a solved polynomial of degree 10. With love from your higher order derivatives of maxima and minima, of an unknown function.